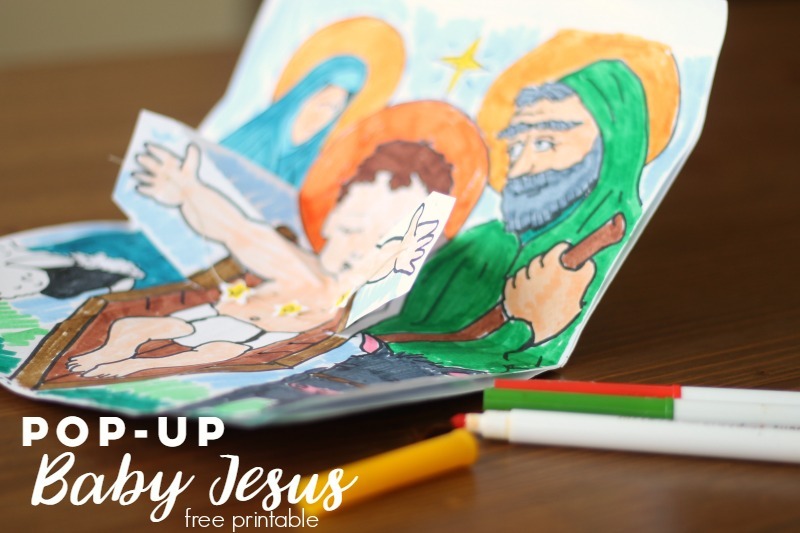 This Pop-Up Baby Jesus activity is simple and spectacular. 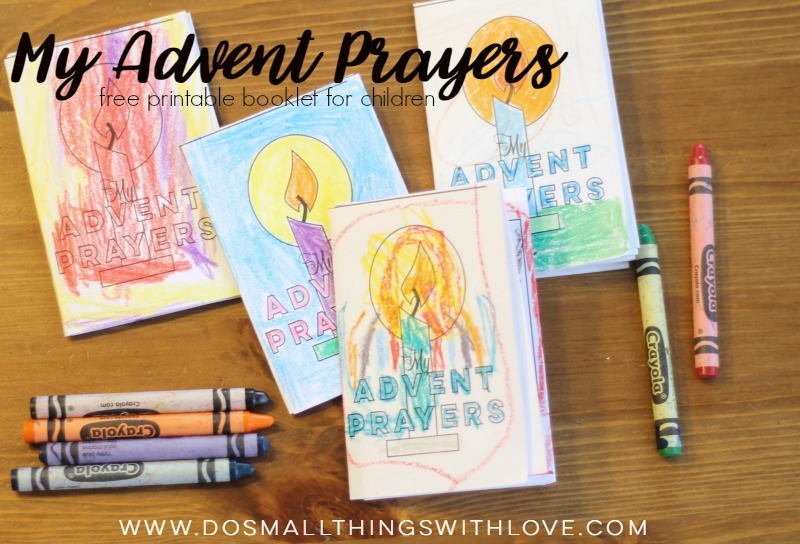 Download the free printable, pull out the markers and the glue sticks and create something fun, meaningful and seriously cool this Christmas. This past weekend we celebrated Christmas with my mom’s family with three day event we call Cross Christmas Camp. That side of the family is huge and we actually rent a Bible Camp for the weekend each year. It’s a blast (and a little crazy). This year we upped the ante and all got t-shirts. 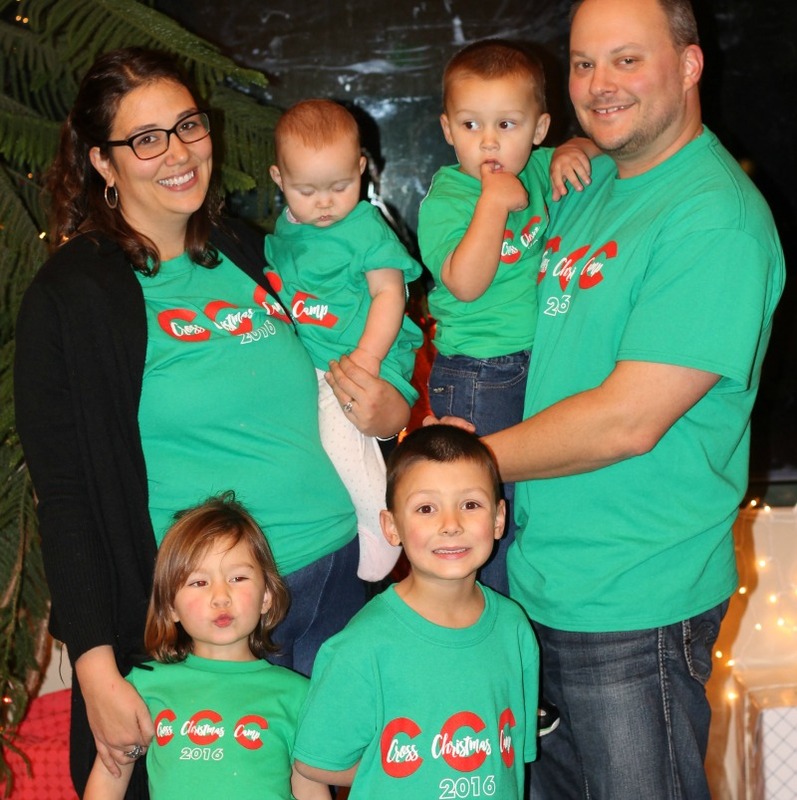 Here’s my crew in our CCC threads. Not exactly Christmas Card worthy, but packed with memories. At Cross Christmas Camp we eat meals together, play board games, decorate cookies, sing carols, welcome Santa, open gifts, each tons of sweets, laugh and talk and every single year we craft. The crafts this year were a variety of coloring projects, but one, created by my Uncle Dan, was just so cool I had to share it with you, and he was kind enough to let me. 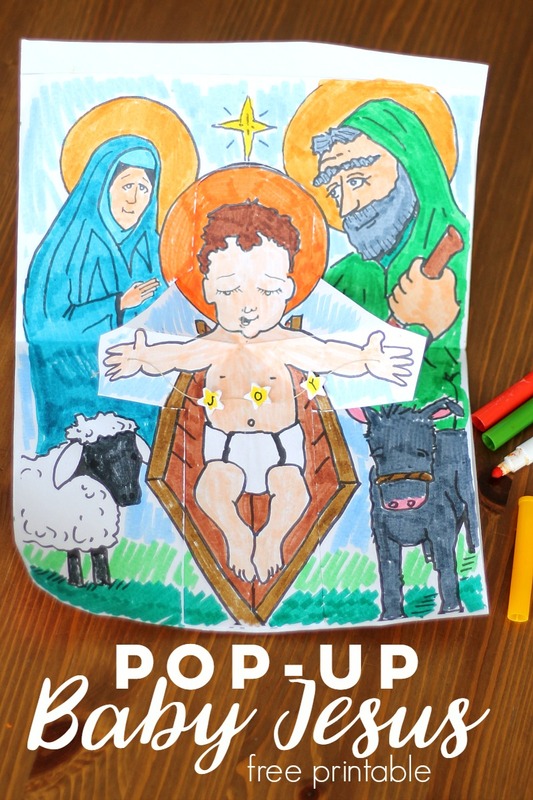 It’s the Pop Up Baby Jesus. Yes, it actually pops out! 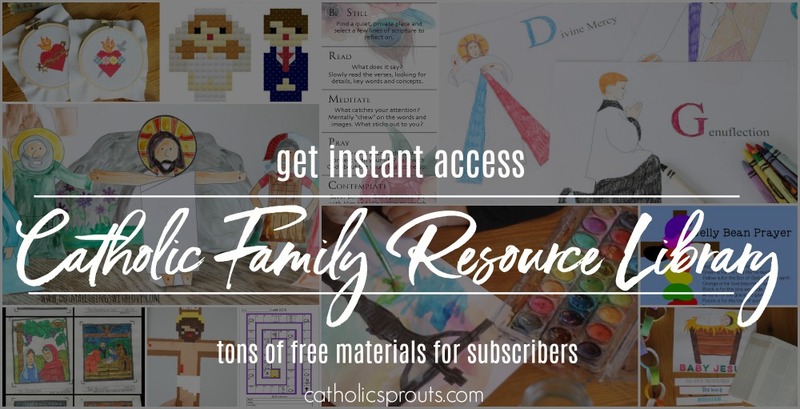 This project is a wonderful way to honor the Holy Family and what I love the most is that it every time you open it up it feels like Baby Jesus is going to give you a big hug. It reminds me of my own chubby babies and how wonderful it feels to have their arms wrapped around me. 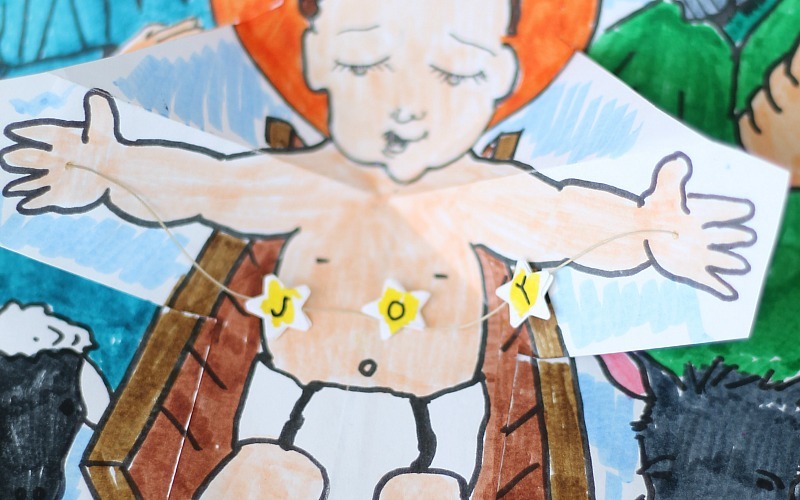 Once the coloring done you can even add a very simple banner proclaiming the good news of Christmas between Baby Jesus’ out-stretched arms. This project comes together with just two printed pages and a glue stick, but getting it together, and making it pop out is just a tiny bit tricky. Here’s what you need to do. 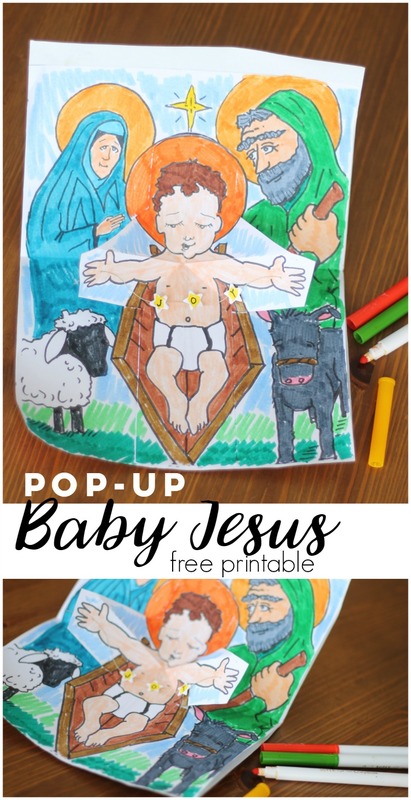 First off, print out both pages of the Pop-Up Baby Jesus project on regular printer paper. 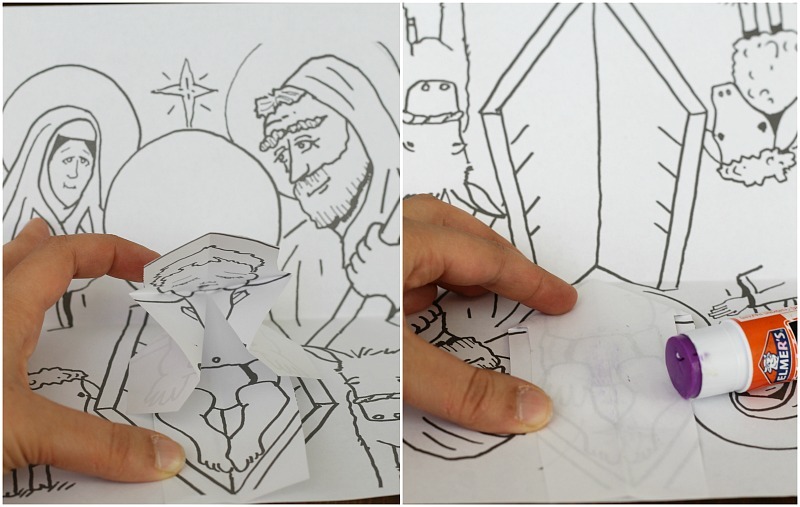 Set aside the page with Mary and Joseph. First you need to work with the Baby Jesus page. Now this is important. FOLD BEFORE YOU CUT. 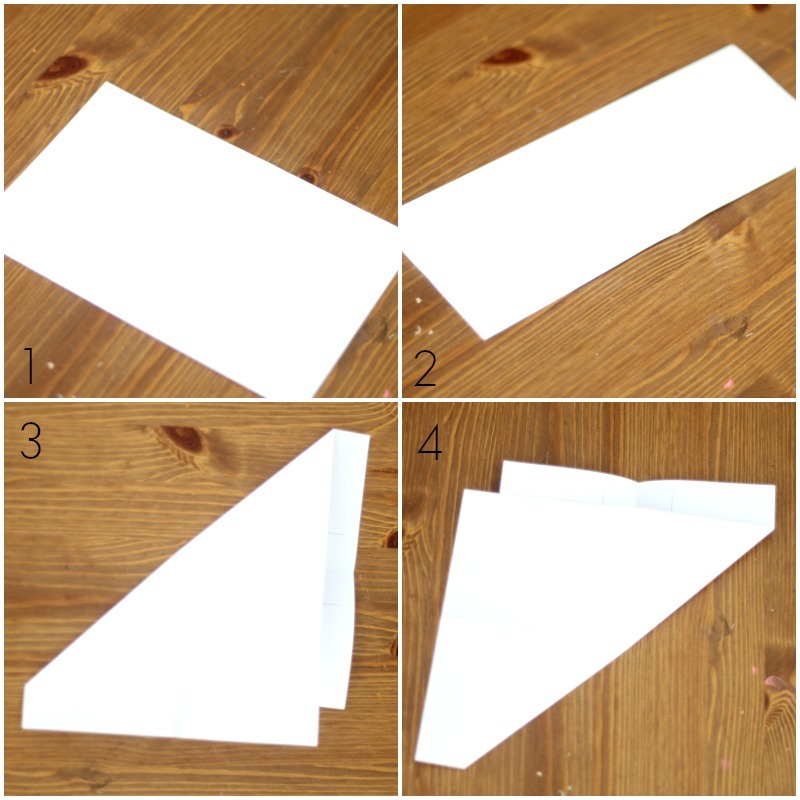 2–Open up the 1st fold and fold the paper vertically. 3–Now it’s going to get a little tricky. Open up your paper and note the center where the first two fold cross. This point is important. Both folds 3 and 4 need to pass through this point. For the next fold you are going to fold the paper diagonally, so that the vertical line lays on top of the horizontal line, making sure that you fold through that center point. 4–Open up your paper and make another diagonal fold that matches up the vertical and horizontal folds, going in the opposite direction, but also passing through that center point. In case a video would be helpful, HERE is a similar project. Skip the cutting at the beginning and go to the point where she is folding the white “t” shaped piece of paper. After your folds are done, open up your paper and cut along the dotted line. Now, Baby Jesus has folds in all the right places, but some of the folds need to be pushed in. Gently push the arms in as shown below and fold down flat. Hang in there! We are almost done. Just the gluing left! Grab the page with Mary and Joseph. Fold it horizontally and tuck the folded up Baby Jesus inside. Work to match up the lines of the manger. 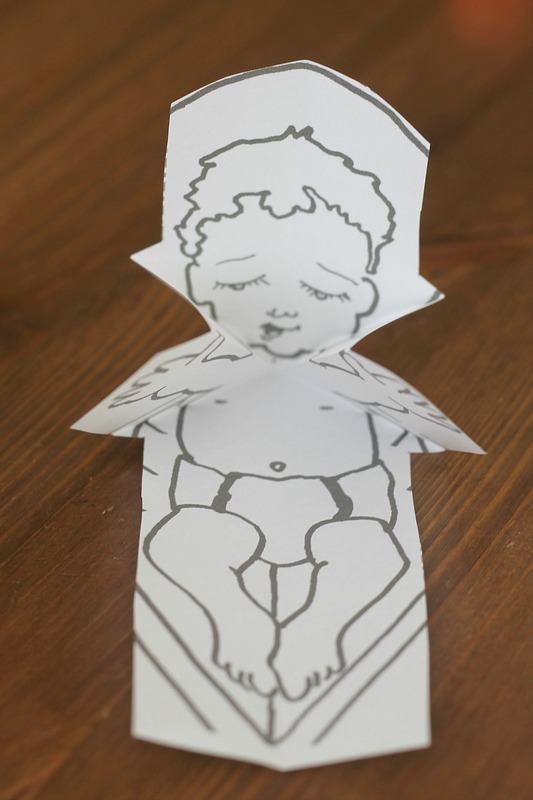 Using a glue stick, apply glue to one side of the folded Baby Jesus at a time and press it into place. 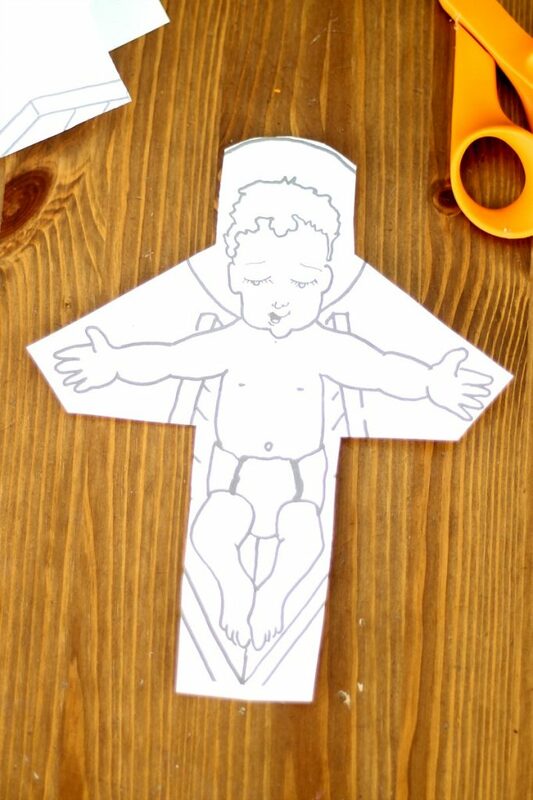 Make sure that you don’t apply any glue to the arms of Baby Jesus. It is easiest to keep the arms folded in while you do the gluing. And that’s it! 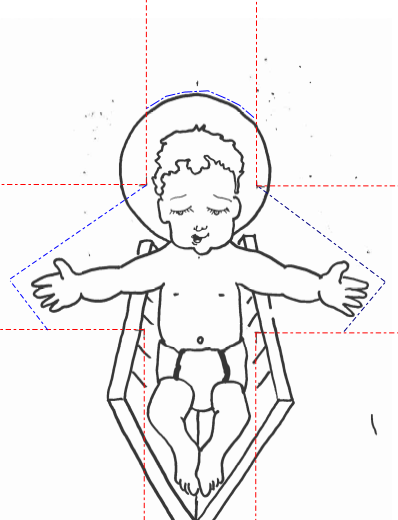 The Pop Up Baby Jesus is all ready to be colored. One final step, if you’d like, is to add a banner between Baby Jesus’s arms. For this you need some string and small paper stars. Select a word (I used “JOY”). You will need 2 stars for every letter of your word. Write a letter on each star and glue them together, with the string sandwiched between the two stars. Space the letters out evening on the string. Then poke a small hole in each of Jesus’s hands and thread the string through. Finally secure the thread to the back of Jesus’s hands. What a fun, simple, cool project. I hope you loved this as much as I did. A big thanks to my talented Uncle Dan! All the best and a very MERRY CHRISTMAS! Advent is a perfect time to really dive into scripture. Whether your family is doing the Jesse Tree or you are working through a Bible Study, this period of waiting for the Lord is best done in His Word. 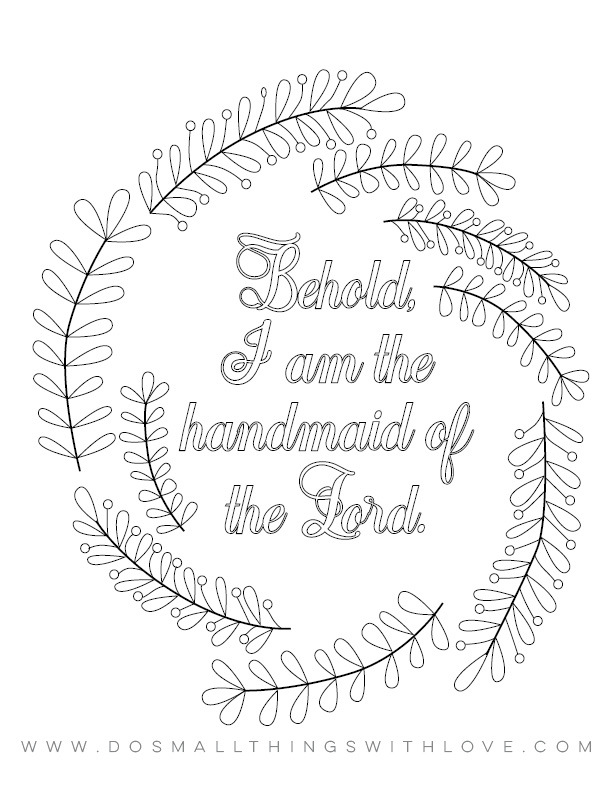 And, for all of us sleep deprived moms, I have created another, very simple coloring page–because I have a tendency to fall asleep while mediating on scripture unless I am actively doing something. 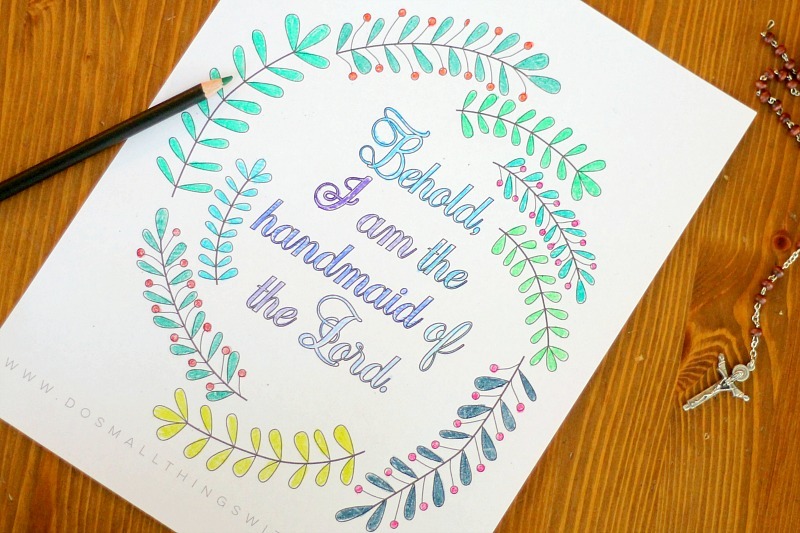 Therefore, I am a big believer in the prayerful art of coloring. I have decided to spend most of my Advent off-line, so I am going to keep this brief today. 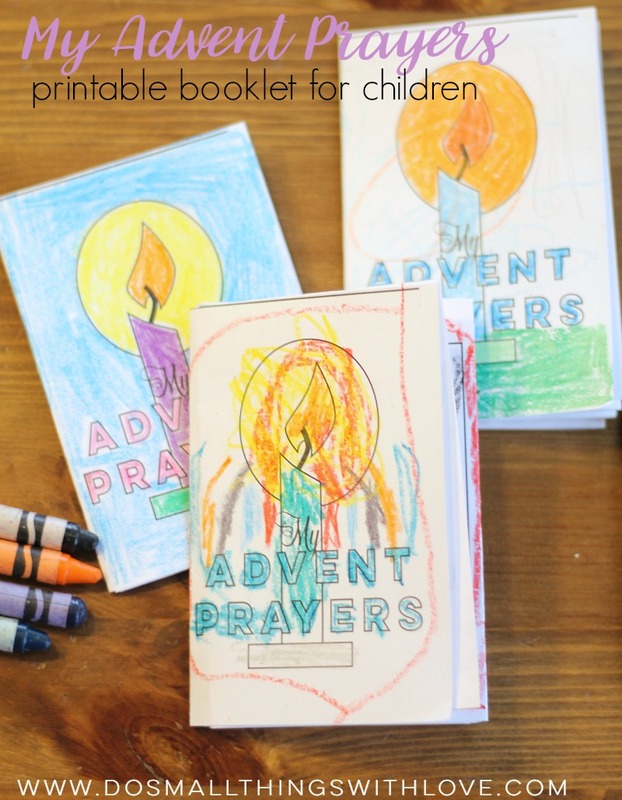 Today’s coloring page is perfect to reflect on during Advent. The words, spoken by our Blessed Mother speak of surrender, trust and complete gift-of-self to God. The words are surrounded by branches forming a bit of a wreath, which in itself holds lots of meaning for us during this season. There is so much to think and reflect on, even in this one little statement. Please use and share it! This coloring page, like all of the coloring pages I have shared so far, is completely free. You can find the PDF of the coloring page right here. Once the link is open, save the file to your computer or print. Or both. I was looking forward all day so to some quiet time this afternoon so I could color my own page. Bernadette, however, refused to take a nap, so I printed off a second copy for her…and I almost like her colorful version better than my own! Regardless, her’s in the one hanging on our fridge right now, reminding me constantly of what it means to be obediant to the Lord. And as we colored we talked about Mary and the Angel and Jesus the baby. Even though it wasn’t quiet, it was still pretty enjoyable. Once again, have a very blessed Advent. Don’t let the world and the radio and the stores trick you. It isn’t Christmas yet! I believe that the prayers of a child are powerful. Their pure little hearts are closer to God than ours and the things they ask for in prayer are often far less selfish and what we ask for. Every evening we gather as a family and sit cross legged on the floor of the kid’s room. After a few prayers recited together we go around and do intentions, starting with our 2 year old and ending with my husband. We have been doing this for years and very often it is a powerful thing. It is powerful to hear dad ask for forgiveness for loosing his temper, to hear mom pray thank God for each child, even after a hard day, and to name all of our beloved family members and ask God to bless them. Gus, our oldest, has long been a prayer warrior. It all started with a little girl named Gia. The daughter of one of my husband’s cousins, Gia suffered through a long, complicated illness with few answers and months and months in a hospital far from home. And Gus prayed for her every single night, without fail. Remarkably, Gia is now home, healthy and we still talk about her as evidence that God really does answer prayers, something that Gus has taken to heart as he continues to pray for his new list of intentions. Top of the list now is a little baby named Lulu that he heard about at school, that was born early and is in a NICU out in California. But, let’s just be real here. Prayer time in this household is usually not magical. Often we are breaking up fights or reminding kids to pay attention. Or both. And, very often the things the kids pray for sort-of misses the mark. Bedazzled by a lit candle the kids will pray for candles and their blanket and candy… And we have to remind them, right then and there, what it mean to pray for someone and why it’s important. With Advent coming right up I decided to do a little work on our intentions outside of our family prayer time. 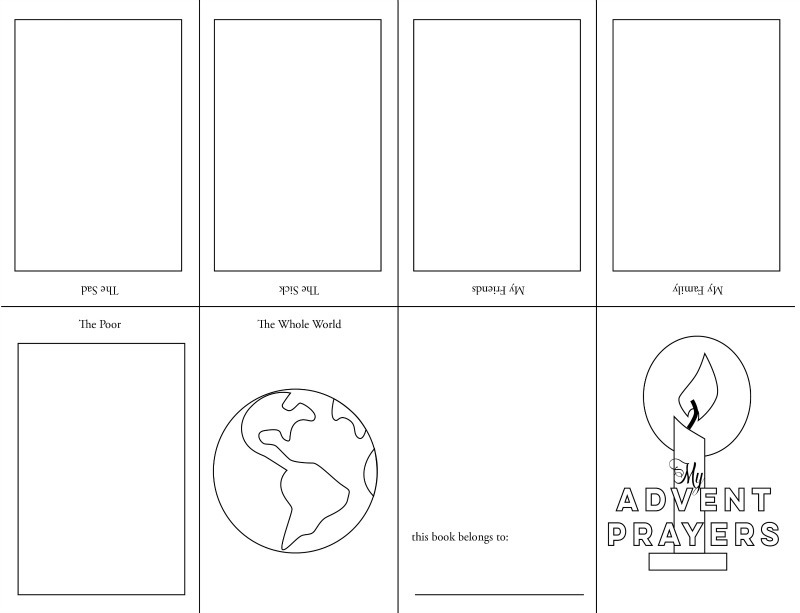 I created these very simple My Advent Prayers Booklets. They are just one page and, through the magic of very simple origami, fold up into a booklet. The booklets are very simple. 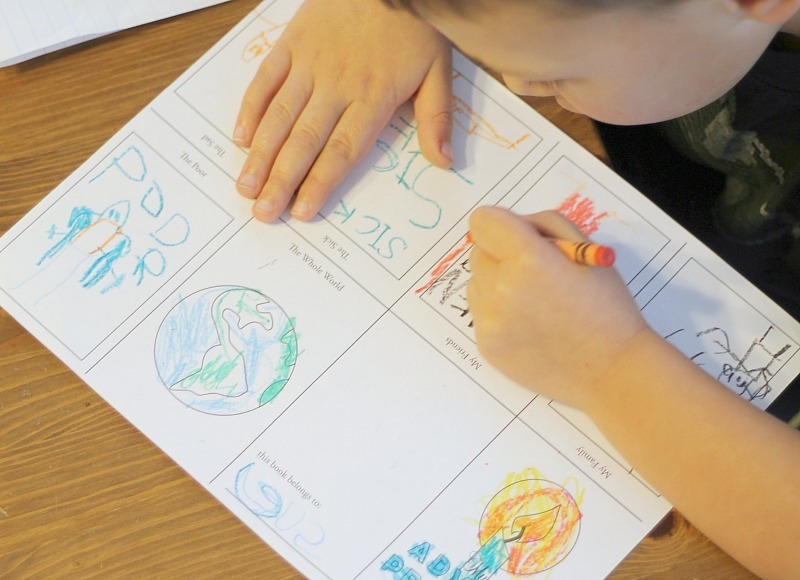 On each of the 6 inside pages children plan out their intentions by either listing names (for older children) or drawing an image. The pages list the following intentions: My Family, My Friends, The Sick, The Sad, The Poor, The Whole World. We just colored and put together our books this morning. Since all of my kids are pre-readers it took a little bit of explaining, but in the end I feel like we had a very fruitful time together. We talked about why we pray for our family and friends. We talked about who we know that is sick and needs our prayers. We talked about the ways people might be sad, and why they need God’s help. We talked about what the poor are in need of. And finally, we talked, just a little bit, about our whole world, and how we can pray for the president and those in power that make the laws, and most especially how we need to pray to protect the little babies not yet born. Assembling the booklets is actually very easy, once you see it done. It’s just complicated to explain, and I know if I try I’ll just confuse us both. So, I shot this super low quality video of the process. Watch it muted unless you want to hear the chatter and racket of my house. And yes, I have my phone taped to a chair for this video, because I thought that would be better than placing the phone in the hands of a 5 year old. Oh, and it’s upside down. Nailed it. 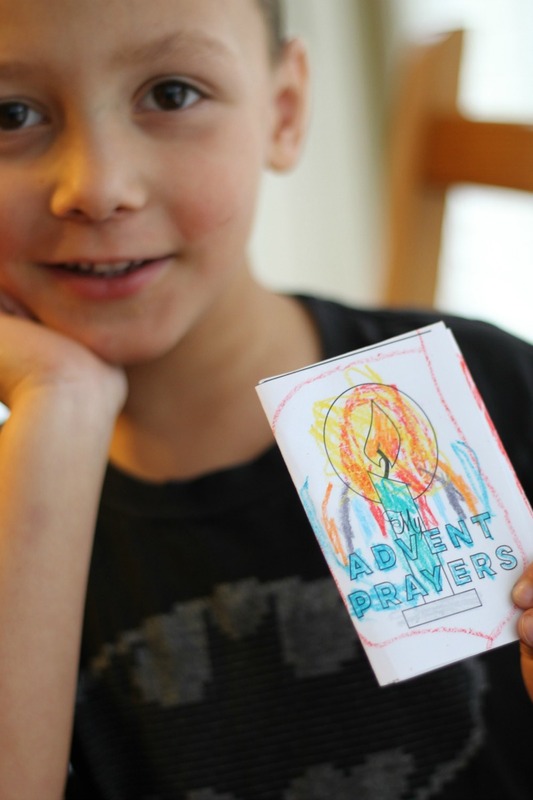 We plan on pulling out these little booklets each night for prayer during Advent. The kids can look through their books and remember all of the people that we need to pray for. The prayers might change, as new illnesses come up or new issues in our world arise, but these big intentions will continue to be important and thanks to the pictures they drew, they can begin to recall these intentions on their own. I really hope these booklets bear great fruit in my family. I would love it if you used it with your family, and if you do, please send me any thoughts or additions you’d like to make.. Here is the link to the file, once again, if you are interested in using it. Have a very blessed Advent! Confession–I am not a scrapbooker. Not at all. I upload the family pictures I take to a very simple blog to share them with family…and that is about it. I take tons of pictures but it is pretty rare that any of those pictures ever get developed. And yet I really wanted something small and simple to mark Gus’s first year at school. 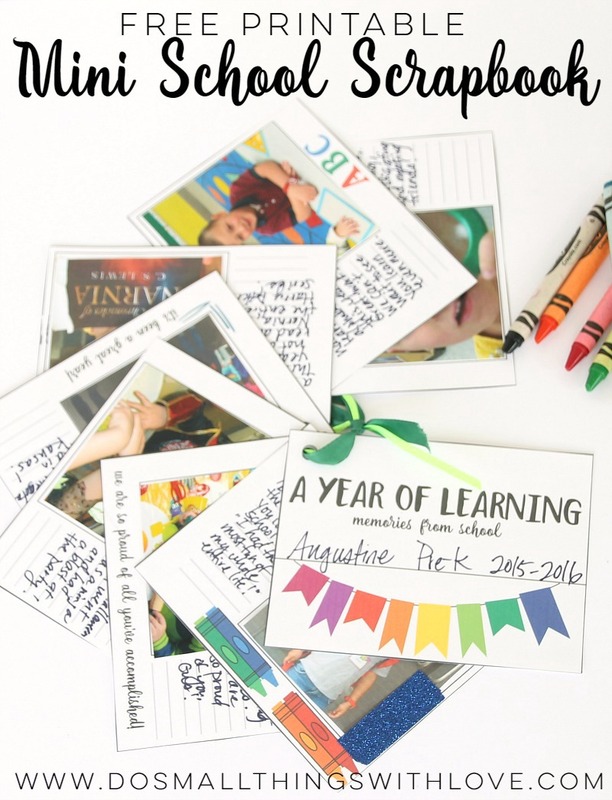 So, I created this mini scrapbook printable for my little one–and hopefully for your’s too! 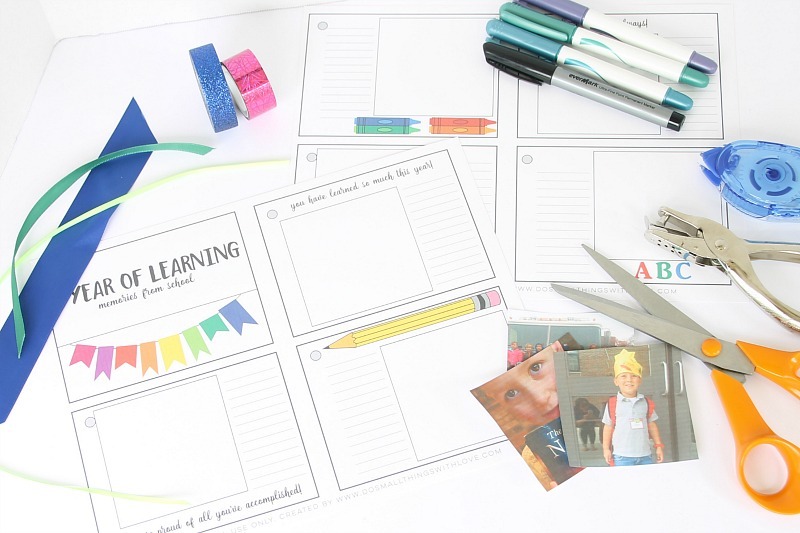 The free printable for these Mini School Scrapbook is laid out on 2 pages. 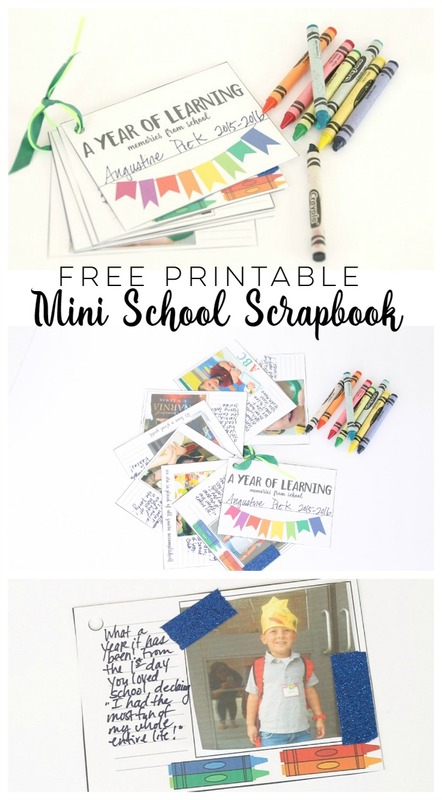 Total there are 8 smaller pages that will make up the Mini School Scrapbook, 7 of which include a spot for a 3″ x 3″ photo as well as a few lines for writing a short memory. Here is an image of the pages. Once you have the PDF downloaded and printed the assembly is pretty simple and can be done in a couple of different ways. And, I printed mine on heavy cardstock, which I think is the best way to print it. To put mine together I used pretty tape, markers, and ribbon to bind the book. You will also need a simple hole bunch as well as 7 pictures cropped to 3″x3″. Here is an example of one of the pages I put together for Gus’s book. Isn’t he the cutest? I snapped this picture after his first day of preschool. When I dropped him off he was in tears, scared. But, when I picked him up he was thrilled and declared, “I had the greatest time of my whole entire life!” What a wonderful gift for this overprotective mom! These are the memories that I want to remember always and I’m so glad to have a place to record them. So, pretty simple, which is the only way I can actually force myself to scrapbook in any way shape or form. From printing to handing it completed to my little Gus it took me about 10 minutes. Yes. And I am so glad I got to print and use some of these cute pictures of Gus. It would have been a shame if I hadn’t. Gus really has had a wonderful year at preschool, both here in Kansas and in Minnesota before we moved. He has had wonderful teachers and made so many terrific friends. And there you have it. 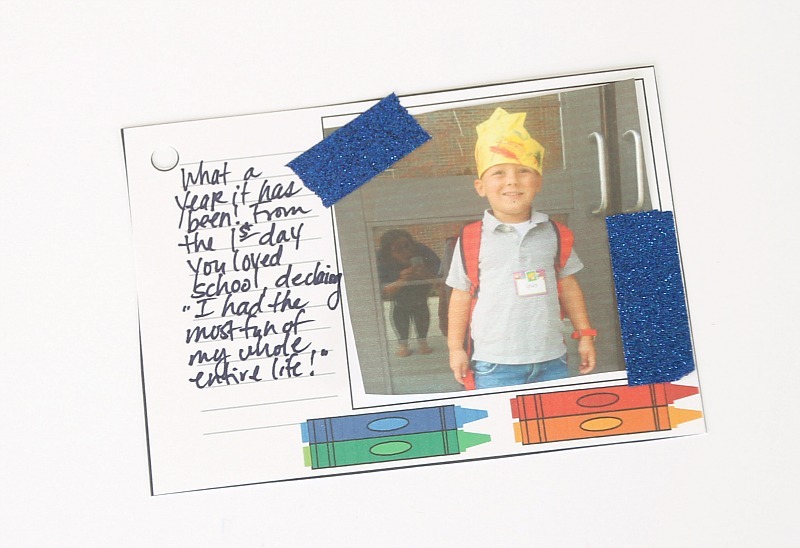 I love this simple little mini school scrapbook I am so happy I made for my Gus. I hope your school year is wrapping up in a wonderful way and that you have some fun plans for summer. My only plan–have a baby around Memorial Day. Whatever happens after that, well, I haven’t really thought that far. Just ready to have this baby on the outside. Thanks for being here and all the best! 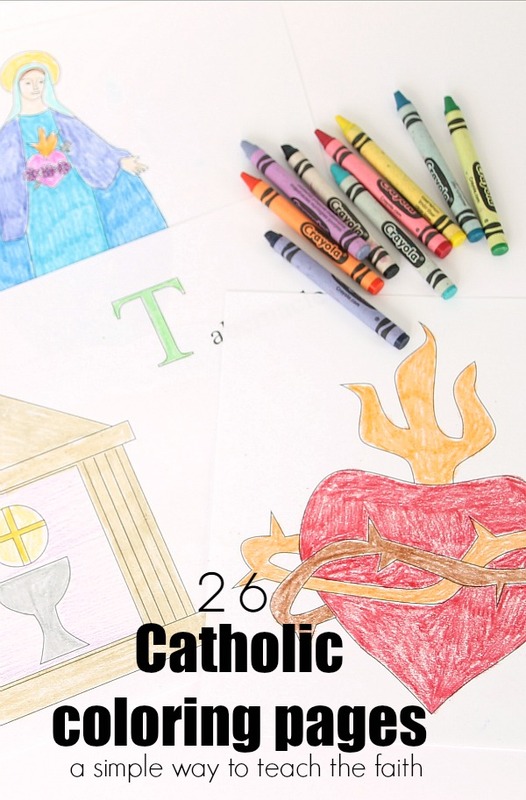 I am so excited to share these 26 FREE Catholic Coloring Pages with you today! Yay! 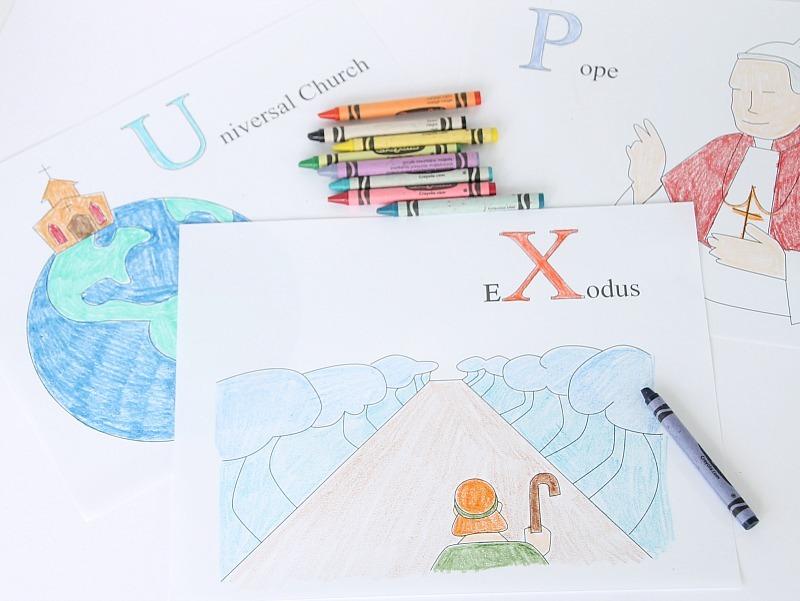 There is a different coloring sheet for each letter of the alphabet. Just enter your email below and they will be sent directly to your inbox! 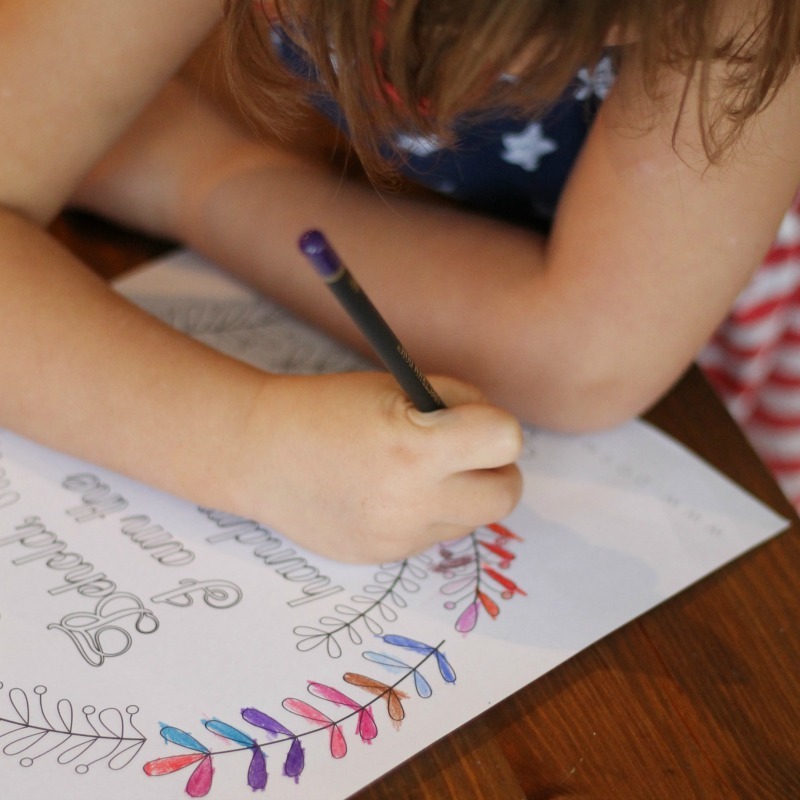 Coloring is a daily activity in my house and when I can, I am right there coloring with my kids. I haven’t really gotten into the Adult Coloring craze, but I guess I never really got out the of the kid coloring faze. Oh well! The other day Bernadette and I were coloring in her Disney Princess book and, as it goes, while we were coloring we were chatting, mostly about what we were coloring. It was a nice moment with my sweet girl, but I got to thinking, what if we were coloring something a bit more meaningful and therefore had something a bit more important to talk about as we colored. What if we were coloring something rich in faith? What if we were talking about the sacraments and the Church instead of Disney Princesses. 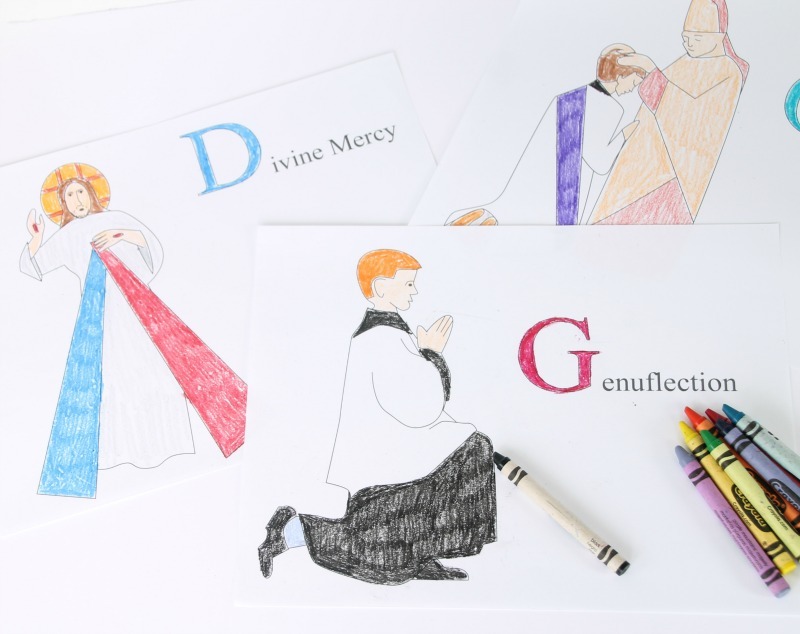 What if this wasn’t just a nice coloring break, but an opportunity to teach the faith? Now that would really be something. 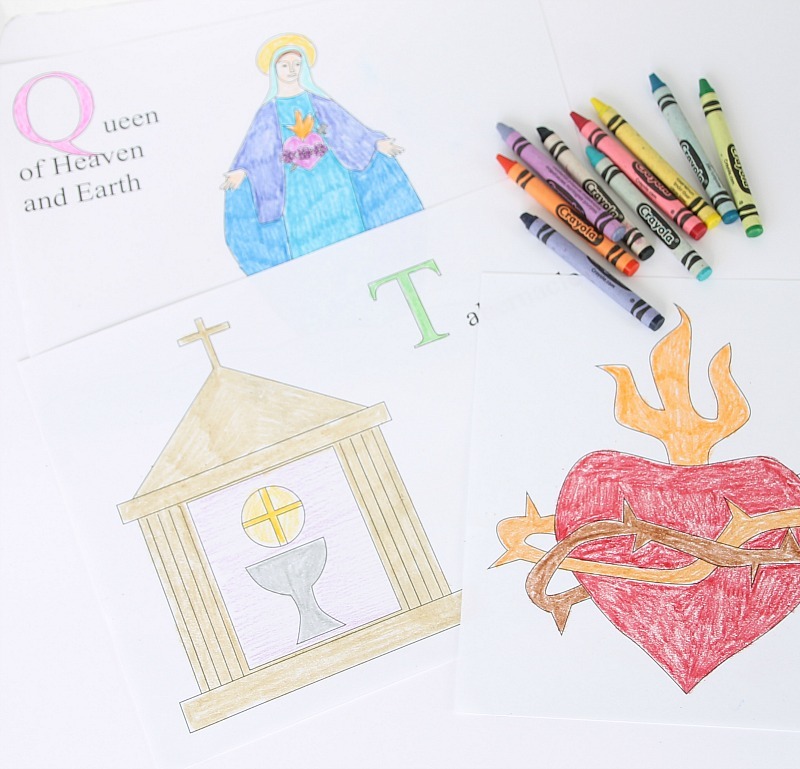 So that night I sat down and drew up 26 Catholic Coloring Pages, one for each letter of the alphabet. 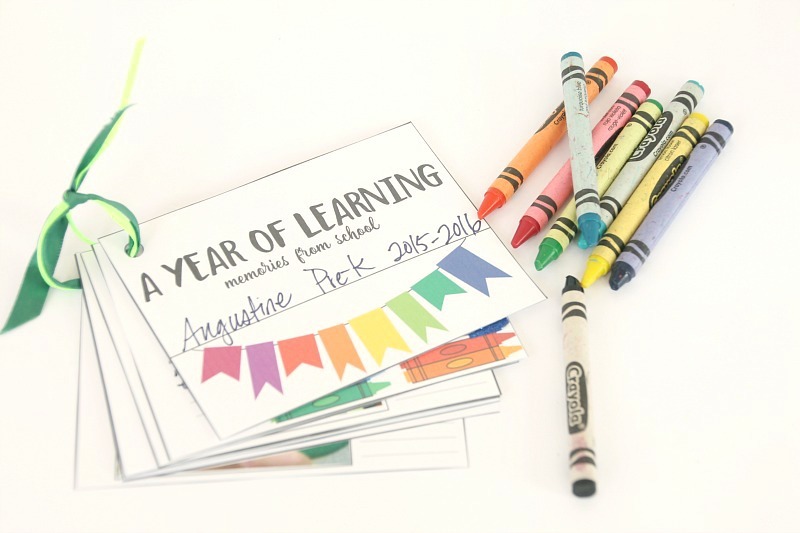 I’m always looking for ways to get my Augustine more engaged in letters (boys) so I thought this might be a great opportunity to throw a little of that in too. I had a lot of fun drawing up these simple designs and my two oldest and I have already started working our way through the pages, enjoying it greatly. Like I said, I am so happy to offer this whole set of 26 pages to you for free. All I ask is that you sign up for my newsletter so that we can stay in touch. 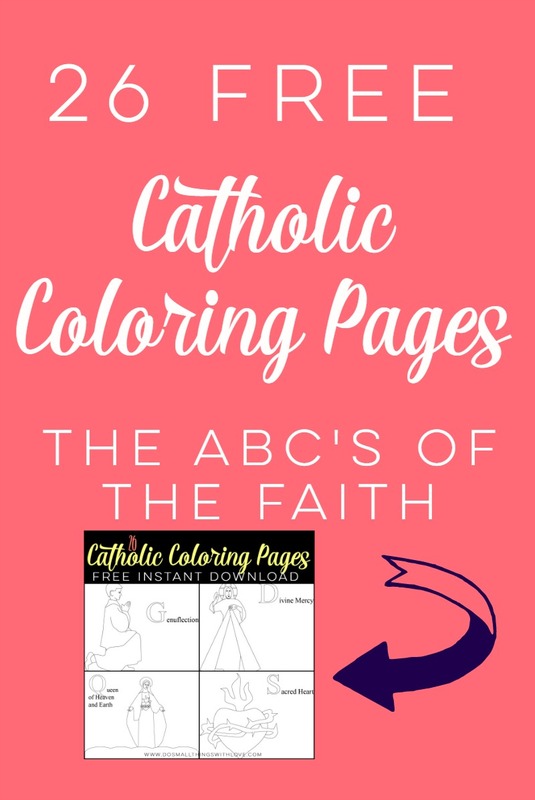 After you have signed up and confirmed your subscription in your email, you will be given a password to a page where you will be able to download and print all 26 coloring sheets in one big bundle. Once you have the file, feel free to use and print and color the sheets as many times as you’d like. I personally plan on using and re-using these pages with my children many times and I hope you feel inspired to do that same. All I ask is that you don’t send this file to others. Instead, direct them to this page and have them download the coloring sheet bundle directly from my site. I hope you use these pages and love them as much as we do. There are few things in this strange blogging journey that give me greater joy than seeing my creations used and baring fruit in families all around the world. 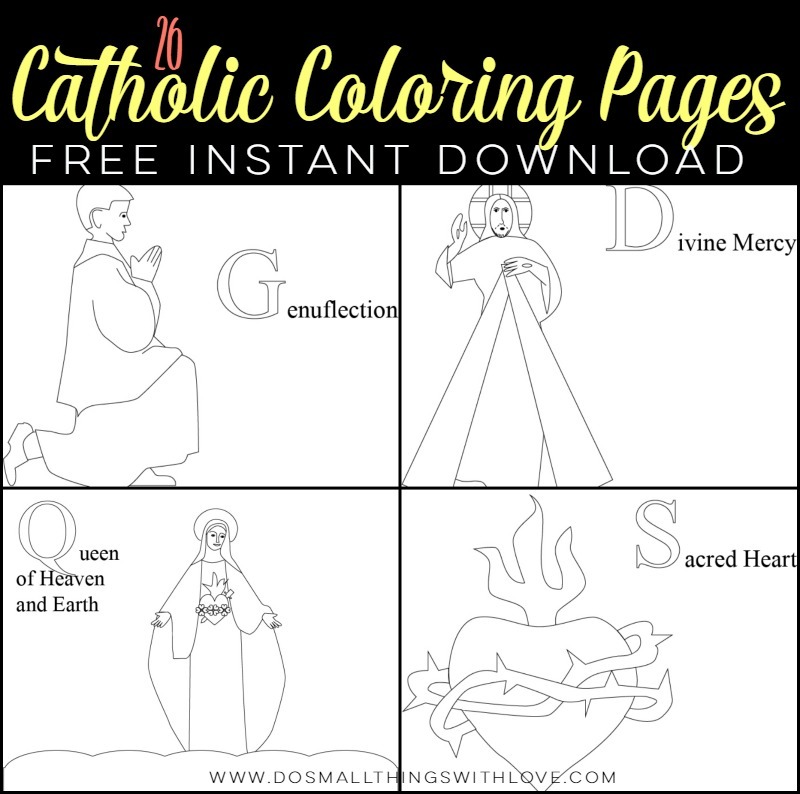 Once again, get this whole bundle of Catholic Coloring Pages for free, sent directly to your inbox.